When looking for the best in stamp pads, it can be hard to know what products to trust. One of the most trusted options on the market is Stazon stamp pad options. 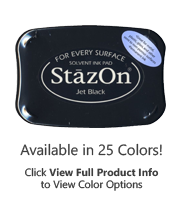 Stazon is an undisputed leader in the creation of high-quality stamp pads for multi-surface stamps. They have built their long-standing reputation on creating ink that offers a vivid impression with each use and incredible longevity for a lasting ink solution. We are honored to offer an array of Stazon stamp pad products to choose from. We offer one of the largest selections of colors and ink types when looking for the staying power of a Stazon stamp pad for your favorite non self-inking stamps. Choose from colors in standard options such as black, gray, midnight blue, and unique colors such as pumpkin, olive green, black cherry, and more. When looking for a permanent impression, we have several stamp pads from this brand to fit the bill. 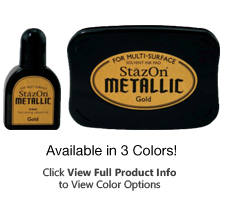 We even offer these reliable Stazon stamp pad options with metallic ink perfect for an array of surfaces and projects. All of the inks offered by this brand feature fast dry times of 3-5 minutes, even on hard to dry surfaces such as metal. In fact, these reliable ink pads can be used to accommodate nearly every surface type including metal, wood, glass, paper, glossy paper, and more. All of the stamp pads we offer from this respected brand are full size making them ideal for a wide range of non-self-inking stamp sizes. When you are looking for ink of exceptional quality that won’t fade, smudge, or smear, it is hard to beat the staying power of Stazon ink pads! Not sure which ink type would be best for your project? We would be happy to help you choose. At Rubber Stamp Champ, we are committed to being your source for all your stamp needs. We offer one of the most diverse inventories to make sure you always get what you need. We would be happy to answer any questions you may have while shopping with us!